You must be asking yourself the question, what is a plant-based sauce? 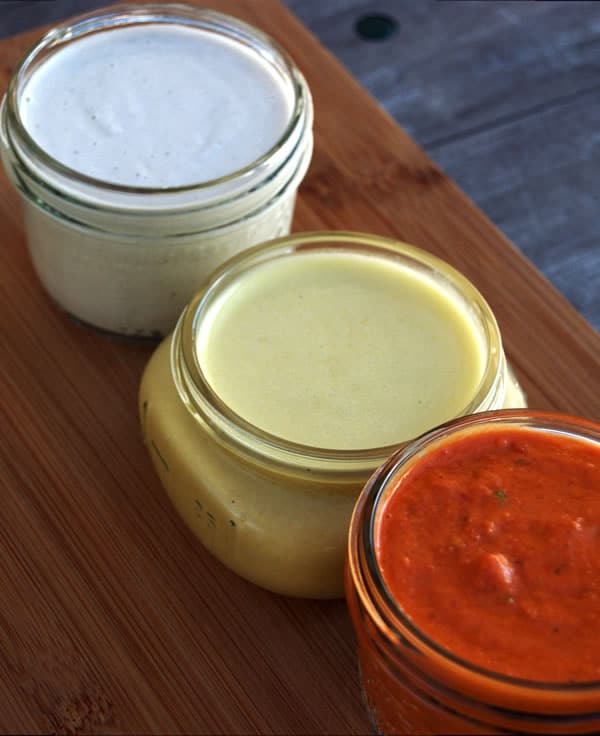 Basically, they are a new form of uncooked sauces for those who are following a plant-based diet, which may include vegetarian, vegan, or the raw cuisine. 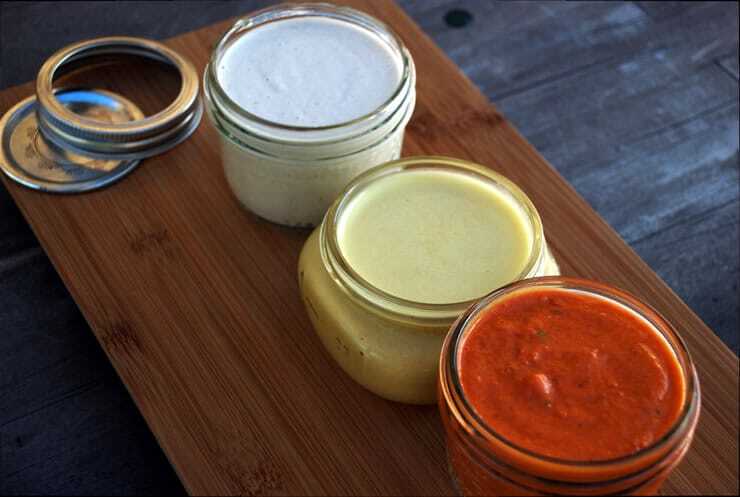 The purpose of any sauce is to improve the flavor profile of a dish. A sauce generally is eaten in small amounts, and needs a concentrated flavor. A balanced sauce offers stimulation to the senses, so it’s a good idea to check and adjust the flavors before serving. It wasn’t until recently that I became aware of the need to learn more about the plant-based diet to expand my knowledge in new cuisines and hopefully along the way sharpen my cooking skills. One takeaway from this culinary journey was the importance of knowing your sauces and how to create new versions. Here, I have chosen three you can easily incorporate into your daily routine and enhance your plant-based dishes. 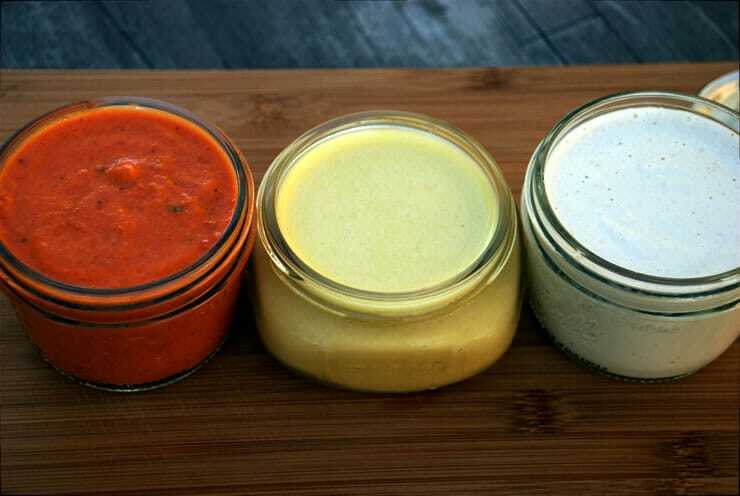 Take these three sauces and make them your own by adding ethnic spices, various oils, citrus, and herbs to create your own unique combinations. Here are a few tips when shopping for ingredients. Browse the ethnic section of your market or a nearby spice shop for new ingredients. Go back to grinding your own spices in a mortar and pestle. It’s a worthwhile experience. Buy good quality nuts and in small amounts. Nuts go rancid quickly. Make your own nut milks, vegetable broths, and mushroom broth to add to your sauces. 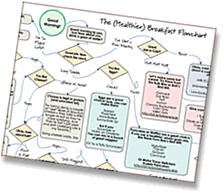 Use these sauces as a guideline and have fun creating new versions! This super simple recipe will be a delight to have as a summer staple. Place the cashews into a bowl and cover with water. Let soak for a few hours. Drain and rinse the cashews. In a blender add the cashews, lemon juice, water, vinegar, and blend until smooth. Add more water if needed. Taste and adjust with salt. This unique twist to tomato sauce will have people scrounging to use it on other recipes. In a blender, add the sun-dried tomatoes, garlic, chile flakes, olive oil, and water or reserved water and blend until smooth. Add the bell peppers, fresh tomatoes, apples, and blend until smooth. Season with salt and pepper. Add the basil and gently pulse a few times. This traditional Japanese dressing will enhance any salad or course you apply it to. In a bowl whisk the miso, oil, orange juice, and salt together until smooth. Add more juice if needed. For Thai Flavor: Add 1 1/2 tablespoons fresh minced ginger, 1/2 minced chili, 3 tablespoons fresh cilantro, 2 tablespoons fresh basil, 2 tablespoons fresh mint. For Asian Flavor: Add 2 tablespoons tamari, 1 teaspoon toasted sesame oil, 2 cloves minced garlic, 2 tablespoons freshly minced ginger. Mary Papoulias-Platis is currently teaching culinary in the San Diego area. Mary also keeps busy as a culinary teacher, cookbook author, and recipe developer. She has written her first book, Cooking Techniques and Recipes with Olive Oil. Mary teaches, speaks, and writes about the Greek lifestyle and diet, and teaches olive oil tasting, having completed the program at U.C Davis as a certified “Olive Oil Taster.” She recently completed her Plant-Based Culinary Program. Author and creator of the long-standing cooking blog, California Greek Girl, you can also find Mary on Facebook and Twitter.